Nice Pebbles has been operating in Nice, on the Côte d'Azur, since 2006. The company began life as a rental agency, but has gradually expanded into sales as their experience of the local market and understanding of clients' needs increased. Unlike many agencies, Nice Pebbles is fully licensed and insured, so clients are guaranteed not only an experienced, hands on complete service, but also total security. "We cater for all clients' budgets whether they are buying or selling with us. We deal with every type of property from exclusive investment properties to small apartments and villas. At the moment, we have many clients looking to buy their first property in Nice, so one and two bedroom apartments are very much in demand. We have seen a quick rise in sales of larger apartments too, as more buyers are looking to enjoy their second home with family members. Also, having a larger apartment for rent where everyone can stay together is perfect and much more cost effective than staying in a hotel." Knowing Nice and its property market so well also means that Nice Pebbles is able to recommend the right areas for clients to find their properties. Investment buyers find the Old Town and the Promenade des Anglais, with its sea views ideal. The Port area is also rising in popularity with these clients, thanks to a new tramline which will link it to the airport in the near future. Second home owners who are seeking more tranquil areas of town might be directed to the quieter and more residential parts of Nice. These include the Carre d'Or, Musiciens and Mont Boron. 2006 saw the first Nice Pebbles office open in Nice. This was set up to offer a complete management service to property owners who wanted to rent their apartments and villas out for vacations, without the hassle of having to make all the arrangements themselves. Many property owners live in Britain or even as far away as the US or Australia, so there was a real and evident need for a service such as the agency offered. Officialdom in France can be complicated and time consuming. So it's a real boon to have someone who understands the system, deal with everything for you. Not speaking the language can be an added headache. Staff at Nice Pebbles are a mix of nationalities, speaking languages fluently such as English, French and Russian, so nothing is lost in translation! After three years in the rental sector, the move to add a sales section began. The idea came from the clients, who, having rented in the area and fallen in love with it, wanted to invest in property themselves. They were increasingly turning to the rental agency they trusted for advice on buying property, and so the sales section of the business was born. Interestingly, this in turn led back to the rental business, as those who invested in property would then ask the agency to rent it out for them. So, the two arms of the business work in harmony, making the service complete in every way. The high standards set by Nice Pebbles gives clients real confidence in the agency. It's the reason that clients return to Nice Pebbles for help to buy or rent, time and time again. The staff understand that maximising the rental potential of a property through quality is important to their clients. Many services are offered by the agency, above and beyond simply finding properties and dealing with the paperwork and legalities for renting or buying and selling. Long experience in the area means that Nice Pebbles is able to recommend top quality, French-registered English speaking tradesmen to complete renovation or decorative work. Staff from the agency will accompany you to signings, arrange the changing of utilities (which can be a frustrating process in France, best handed over to someone else if at all possible!) and keep you updated on developments at all times. Legal personnel are also part of the network. Making the renting, buying and selling process an easy and enjoyable experience is a major part of the company's ethos. It's one thing choosing properties to view through looking at photos in a brochure. However, if you are based many miles and countries away, sometimes photos are not quite enough. This is why Nice Pebbles is introducing a video service. Videos enable clients to get a far more realistic idea of the look and feel of a property. In fact, one couple from America found and bought their property entirely though this service. Their story is an interesting example of how Nice Pebbles rental and sales departments can work together to the benefit of all parties. A client asked the agency to find an investment property for him. A suitable place, in the desirable Old Town, was duly found and the agency arranged renovation and furnishing through their network of professionals. The client then placed the property on the agency's rental books. After a period of time, the client decided he liked Nice so much he wanted to sell the apartment and buy a larger place in the town, so the property was taken on by the sales team. Enter the couple from America, who were holidaying in Nice, with Nice Pebbles. They too, had fallen under Nice's unique spell and, deciding they simply had to find their own perfect apartment, popped into the Nice Pebbles Sales office to ask for help. Looking for a place suitable for their own holidays and to rent out when they would be back home in the States, they left everything in the capable hands of the agency. Realising that the aforementioned apartment might fit the bill, Nice Pebbles made a video presentation of it, and sent it off to the American couple. Able to see so much more from a video than from one dimensional photographs, the couple happily agreed the sale, without having to leave the States. They now enjoy idyllic holidays in their dream apartment, and have a rental income too, all through Nice Pebbles! The market in Nice, for both sales and rentals often favours properties that are "ready to go". The agency makes sure that all work and furnishings are of the highest "boutique style" standard, and finds that this is popular not just with renters, but that these fully furnished properties also sell well. It suits everyone, as this way no rentals are lost during the sales process. While it's always great to know that your clients endorse what you are doing and appreciate the high standards of your service, it's even better to be recognised and rewarded for your efforts. 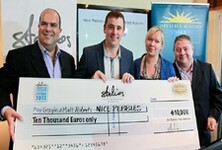 Nice Pebbles and their team have just received the Stelios Award for the Entrepreneur of the Year on the Riviera. This hugely prestigious award has given not only an even higher profile to the business, but also supplied it with a cash boost to enable the team to develop further and offer even more media exposure for their clients' rental properties. Other companies who offer endorsement of Nice Pebbles include Fodors, Frommers, Lonely Planet and Trip Advisor. The business is owned by Gayle and Matthew Roberts, who started Nice Pebbles from scratch, gradually building it into the successful enterprise it is today. They have also built a dedicated team who offer a personal service at all times. Nice Pebbles prides itself on its continuing excellent reputation across all sectors of the business. The agency provides a service clients can trust completely. The team at Nice Pebbles appreciate quality in everything they do, which is one reason they have decided to advertise with French Property Links (FPL). They like the user friendly way the site works, and the fact that FPL properties are always at the top of Google searches, ensuring maximum publicity at all times. FPL, like Nice Pebbles, treats clients as individuals and are always on hand to offer extra help if required.